Cave Air Dynamics & Geochemistry - Welcome to the Paha Sapa Grotto! Caves each have their own unique atmospheric chemistry and a distinct barometric response to external pressure changes. These characteristic footprints can vary from simplistic linear responses to highly complex multivariate systems with numerous feedback loops. The following sections discuss first the causes of airflow within caves, and then the nature of that air from a geochemical standpoint. Jewel Cave Barometric Data - Andreas Pflitsch et al. 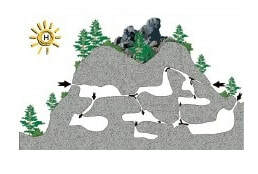 The last section will outline what is currently known about these atmospheric factors in Black Hills caves, who is doing the research, and a bit about the ongoing projects here in the Hills. In general, the larger the cave’s volume, the more substantial will be the flow of air in and out with a given change in barometric pressure. Other factors that determine flow rate are the size, number and elevations of any openings back to the surface. The response observed from barometric and other physical changes depends on a number of complexly interdependent factors that can either accentuate or retard flow under a given set of conditions. A cave’s size, geometry, wall roughness and passage tortuosity all effect airflow characteristics, as do the relative sizes and proximity of openings to one another. Caves can breathe for a number of different reasons. Barometric shifts are one of the primary drivers for flow, but movement may also be induced from chimney effects and wind variations when there is an elevation difference between multiple openings. A difference in air temperature and/or density between openings or even portions of an opening can lead to observable airflow. These air density differences are usually small and tend to be seasonal and/or diurnal in nature. 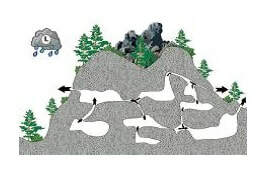 Low to moderate levels of air flow can occur in response to daily and seasonal temperature fluctuations, depending on cave size and geometry. Cold air can be trapped in low spots and lead to ice accumulations where a single entrance is present and the interior recesses are significantly below the opening. 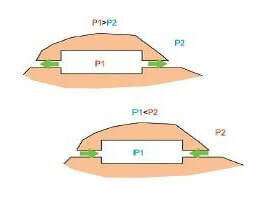 The adjacent diagram shows the thermal regime in a small pocket type cave. Air movement in response to seasonal thermal patterns will cause breathing in during the fall and winter months and out during the spring and fall seasons. It is not uncommon for a breathing cave to have contributions to it's flow patterns from more than one of the above mechanisms. Careful observations and flow measurements are usually required to separate the effects of each. 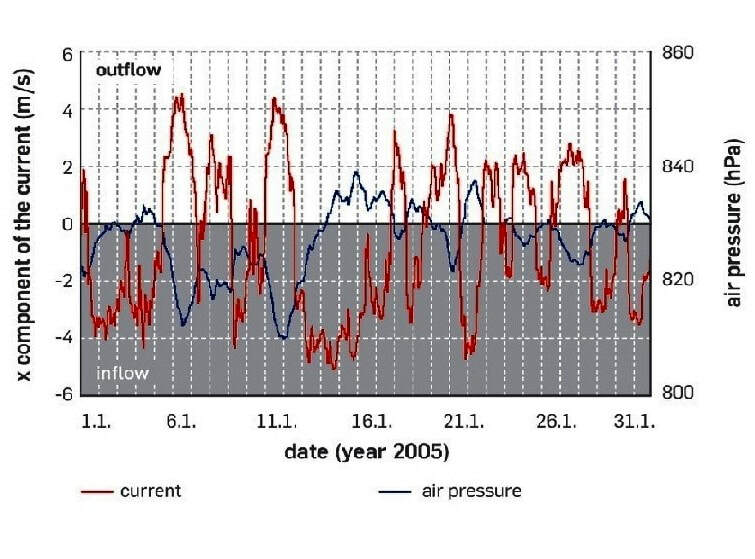 In a barometric cave where the number of openings are few, and in which the effects of chimney flow are minimal to absent, the inflow and outflow rates will be directly related to the system's volume. This means that the cave's ultimate volume or "size" can be estimated for the portions of the system above the water table. Additionally, if enough is known about the average passage characteristics in the portions that are mapped, a tentative"length" can be approximated for the system. Cave barometry is an extremely powerful tool in the assessment of the significance and size of cave resources. The chemistry of spelean atmospheres are by no means static or simple in terms of gaseous makeup. Depending on the types of carbonates present, the minor and trace element contents of those carbonates and their proximity to other nearby lithologies, a cave’s geochemical signature can vary from relatively uniform to highly complex. In general, larger caves with fewer entrances have more complex and unique atmospheres, but smaller caves can have distinct and surprisingly multifaceted signatures as well. All of the gases present in the outside atmosphere are also found in the average cave system. Given this framework, there will typically be compositional shifts within the cave's atmosphere that have been induced by the geochemistry and biochemistry of the wall rock and biota present. The cave’s barometry, geometry and temperature also play a key role in determining the flow and exchange rates of the interior air with the outside as well as the diffusion of cave specific gaseous components outwards. The following chart shows all of the major atmospheric gases and a suite of others that have been recognized and studied in various cave systems worldwide. This list is by no means all inclusive, as many others are possible. The average atmospheric value for each gas is listed as an index for assessing possible anomalous concentrations in a cave's environment. Some of the most likely sources for an anomalous gas concentration are also given. The lighter-than-air gases are all highlighted in blue at the top of the list, and will diffuse rapidly if generated within the cave environment. Anomalous levels of these gases in a cave's atmosphere would therefore indicate a relatively high inward flux rate, or a very slow rate of exchange with the surface. The light gases will typically have the most variable concentrations within cave air over time due to their lower densities and higher diffusion rates relative to the average air mixture. Click on one of the above links for more information on the nature and distribution of these heavy gas components of cave atmospheres. Another ongoing research project involves an assessment of the seasonal concentrations and distribution of radon, carbon dioxide ,water vapor and temperature within Black Hills Caves. This study is currently in its infancy and only a few caves have been evaluated so far, but the goal is to expand the testing and monitoring to a representative population of Hills caves so as to establish baseline atmospheric concentrations for these gases and atmospheric parameters. One aspect of this study is the determination of the seasonal patterns of CO2 concentration in both barometric and non-barometric caves in the area and to see whether CO2 concentrations may be effecting and/or limiting the speleogenetic process therein. Black hills caves are generally wet but sparsely decorated on the average, which is unusual, considering their generally accepted age. One possibility is that this paucity may be due to high ambient CO2 concentrations above 4000 ppm, which has been suggested as an upper limit beyond which speleothem precipitation may not be able to occur. Defining this atmospheric parameter may help to answer this question.